A framework to selecting the right solution for your community platform needs. When evaluating online community platforms, choosing the right solution is no small matter. 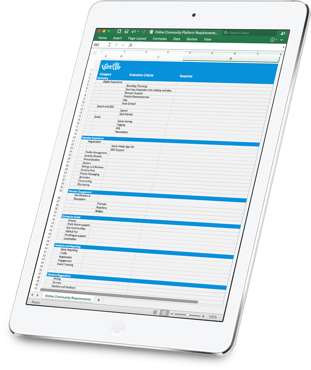 This editable MicrosoftExcel spreadsheet is based on our years of helping organizations move off legacy platforms that are deficient or lack support for future needs. This practical requirements checklist covers 100+ specific features and functionality that organizations should looking for in an online community platform. It provides a framework for identifying and organizing your requirements from the perspective of all your company stakeholders, the intended membership (customers, partners and/or employees) and executive management. Grab your copy now and make your vendor selection process easier.